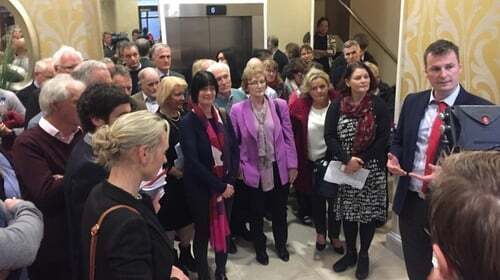 Up to 50 GPs walked out of an Extraordinary General Meeting of the Irish College of General Practitioners today, complaining that their voices have not been heard ahead of the introduction of abortion services in January. The group of largely anti-abortion doctors wanted to vote on a series of motions but were refused that request. More than 300 doctors attended the meeting. A GP-led abortion service is expected to be introduced from January 2019, once the legislation is passed in the Dáil. Hundreds of GPs have already said they will not provide the service because they have a conscientious objection to abortion. The Irish College of General Practitioners is the professional and training body for family doctors. Hundreds of its members petitioned to hold today's EGM. Some are conscientious objectors and do not wish to provide the service to women, while others are concerned about how they will manage the extra work load. The ICGP said the purpose of the meeting was to consult and listen to members. In a statement this evening, the ICGP said it was "disappointed" at the decision of GPs to stage a walk-out. It said over 250 members stayed for a meaningful debate, where a range of views were heard from the floor. Dr Tony Cox, Medical Director of the ICGP, said: "The College's remit is to provide training and education for all GPs, and for those GPs who wish to offer this service. "We are aware of the concerns of those with a conscientious objection to providing termination of pregnancy services, and we have successfully advocated for an 'opt-in' service and for a 24-hour helpline as the first point of information for those who seek the service." He added: "We are sorry that those who walked out didn't stay to listen, as there was a meaningful discussion of all the issues on the agenda." Meanwhile, Minister for Health Simon Harris has said he is confident there will be enough doctors to provide abortion services from January, despite conscientious objections. Minister Harris said contracts have been agreed and expressions of interest have been sent to GPs. The termination of a pregnancy up to nine weeks will be introduced in Ireland from the beginning of next month, following the repeal of the Eighth Amendment. Mr Harris said that while the law on abortion is changing, the rules around conscientious objections are not. He said: "No doctor, no nurse or no midwife will be made or forced to provide a service they conscientiously object to, but equally no woman in the country will be left without access to healthcare that will be legal." Mr Harris said he hopes the reaching of a deal with the Irish Medical Organisation last month, on the provision of abortions in community settings, will result in more doctors being willing to provide the service. He also said the HSE is setting up a 24-hour helpline, that will be a first point of call for women and which will provide information on where abortion services may be available.